We listen to our customers and provide them with products that meet their needs, whether lifestyle requirements as in performance and longevity, or design preferences as in color, style, and texture. With manufacturing enhancements, you have a wide variety of choices to beautify your home with water-resistant flooring. Our flooring company purposefully chooses brands that use technology to improve their flooring. During the manufacturing process, carpeting is treated to resist liquids, such as water, and repel stains. What this means for you is worry-free carpeting. Plus, you don’t sacrifice anything in the way of looks. The brands we offer include waterproof carpeting that is plush, soft, and gorgeous. Come into our showroom to talk to our sales and design professionals about your choices in water-resistant floor coverings. Of course, you may know already that it resists scratches and scuffs and cleans up easily. 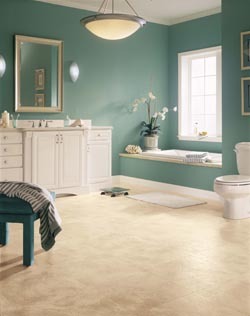 But you may be surprised to learn luxury vinyl flooring is waterproof. As this is manufactured flooring, the needs of consumers are incorporated into the materials and means of making vinyl floors. With its ability to look like wood or tile, vinyl is coveted for its decorating possibilities. And, with its resistance to water, vinyl is ideal for any room of your house including the kitchen, bathroom, and basement. Laminate, too, is manufactured flooring. This means it’s made with properties that allow these surfaces to resist water and liquids in general. This is especially important in a household with children and pets. With all of our water-resistant flooring products comes design versatility for your home. You don’t have to limit your choices because certain rooms of the house are “wet” rooms, where water is in use, or below-grade, like the basement. You can install our waterproof flooring in any room of your house. Contact us today for more information about the style and selection we provide in waterproof flooring for your home. With a showroom in Oxford, Alabama, we proudly serve residential and commercial customers in Calhoun, Talladega, and Lincoln counties, as well as Bynum and Delta, and the surrounding areas.